There never is a good time to get a virus on your server or workstation. Likewise, we usually don’t have the luxury of scheduling downtime for hardware failures or glitchy software updates. Generally, it’s quite the opposite: it happens when you’re trying to meet your biggest client’s deadline. The unpredictable reality of the reactionary “we fix it when it breaks” philosophy wreaks havoc on everyone and everything, including IT budgets. People can’t work. Technology, by definition, is intended to solve problems, not create them. Understanding how your IT puzzle pieces work together to support your needs is critical for any organization. INCS Full Technology Assessments help identify where managed services make sense. We conduct an assessment of your network components, allowing us to establish a fixed monthly cost for IT support per user. Our INCS remote management utilities watch for failures and often notify us of potential downtime in advance. This way, parts can be ordered in advance and downtime can be scheduled during off hours. We test software updates prior to implementation so if problems arise, they can be fixed before the user ever is impacted. Large corporations have benefited from this strategy for decades. It’s natural to adopt the “we’ll fix it when it breaks” philosophy, unpredictable as it is. But as the technology used in remote management has continued to evolve, we at INCS have seen more client companies implement and benefit from remote management. It provides predictable support costs, improved growth forecasting and more efficient responses to inevitable hardware failures. Managed services are becoming the norm because they improve companies’ bottom lines. Imagine how much more productive your team can be with the downtime you’ll eliminate. 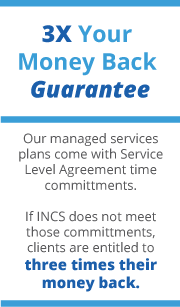 At INCS, we offer several tiers of service so you can select acceptable support levels at a price that fits your IT budget … and so you can sleep well at night.